Open to Virginia Chance School students and to the public. Welcome Friends! CAMP REGISTRATION IS AT THE BOTTOM OF THIS PAGE! At Virginia Chance School, summer is welcomed! 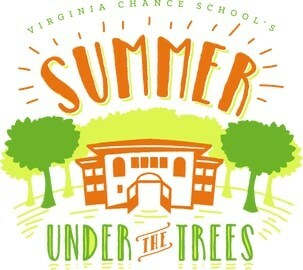 Summer Under the Trees is an outdoor camp for the adventurous child ages 2 years through 5th grade. Summer Under the Trees nurtures children’s natural sense of wonder and fosters a lifelong connection to the outdoor world through dynamic child-initiated play and outdoor discovery. Gather with friends and experienced teachers as we explore our beautiful 26-acre campus in a summer of outdoor games, art, music and fun! For the 2-year-old camper Camp is an opportunity for our two-year-old friends to adapt to a new situation in a safe, nurturing environment. Routines are consistent and schedules are simple to ease the transition to a new setting. Our youngest campers practice their newly found independence while exploring each of the outdoor themes. Activities include books, art projects, pretend play and lots of physical activities. Campers attend one or more weeks in three-day or five-day sessions. (Mon.-Wed., or Mon. – Fri.) from 8:30 – 11:30 or 8:30 – 1:00. For the 3- and 4-year-old camper Camp provides these curious minds the opportunity to be self-reliant, independent decision-makers. hrough the weekly outdoor themes, three- and four- year-olds are able to participate in planning art projects, science investigations and open-ended play. Campers attend one or more weeks, Monday through Friday 8:30 – 11:30, 8:30 – 1:00 or 8:30 – 4:00. (Threes also have the option to attend only M-W.) Children staying until 1:00 enjoy lunch brought from home and a little extra time with their friends! Children staying until 4:00 will enjoy lunch, a nap or rest as needed, and some extra time to explore the weekly theme. For campers entering kindergarten through 1st grade It’s a whole new world Under the Trees for elementary school friends! These growing campers are ready to explore new areas of camp, try their hand and more advanced skills and make new friends. Every week includes nature journaling, time in the Learning Greenhouse, exploring the woods and fields and all the camp activities the “big kids” do! Campers attend one or more weeks, Monday through Friday 8:30 – 1:00 or 8:30 – 4:00. Children staying until 1:00 enjoy lunch brought from home and a little extra time with their friends! Children staying until 4:00 will enjoy lunch and some extra time to explore the weekly theme. For campers entering second through fifth grades For these growing explorers, camp provides the perfect balance between adult-driven and child-inspired inquiry. The interests of the children guide the activities within each theme. With a vested interest in what happens at camp, elementary children gain a deep, meaningful knowledge of the thematic topics while they have a great time and develop new friendships. Every week these campers will have the opportunity to be reading buddies to our younger campers, take pictures and write articles about what is going on around camp for our weekly newsletter, and contribute to other camp projects. These oldest campers are true leaders Under the Trees! Campers attend one or more weeks, Monday through Friday 8:30 – 1:00 or 8:30 – 4:00. Children staying until 1:00 enjoy lunch brought from home and a little extra time with their friends! Children staying until 4:00 will enjoy lunch and some extra time to explore the weekly theme.